Book Review: John Scalzi – Redshirts – Did I miss something? Let me start with saying I’m not a John Scalzi basher. I read his blog and for the most part I enjoy what he posts. I read Old Man’s War a long time back and thought it was an okay book. Interesting concept. Adequately told. Just not really my cup of tea. Also keep in mind that I’m not the kind of person that likes bashing a book just for the sake of bashing a book, but because this one has so many great reviews, and awards, I have to wonder…Did I miss something? I bought the RedShirts ebook thinking this is something new by him. It’s won awards. Been nominated for others. The thing that got me to actually finish this book was that the audio book version was read by Wil Wheaton. As I said, I like John for reasons other than his writing. Wil Wheaton could read the phone book and I would enjoy listening to him. His reading of Ready Player One was brilliant. I had downloaded the sample of chapters 1-4 and thought he really had something here. Sadly, the only reason I finished this book at all was because of the narration. Wil did a fantastic job reading this book even though ‘said’ was probably the #1 word in the book. Enough that it was like nails in my brain every time I heard ‘said’ over and over and over again. The writing was okay. The humor, well, if Wil hadn’t been reading it I think it would have fallen flat for me. I giggled at a couple points (sadly only in chapter 1 and 2), but there were no surprising, laugh out loud moments that, based on other reviews, I went in expecting. I mean, award-winning sci-fi here! Am I missing the entire point? It felt, to me, like bad fan fiction with better grammar and decent editing and an actual plot. Honestly, the short stories after the main part of the book were better, but felt like bloated afterthoughts. Long rambles just to try and up the word count. As I said, if it hadn’t been for Wil, I would never have finished this book. I’m sad it won awards when so many far better books lost out. Was it a complete waste of time? No more than sitting and watching a home improvement show or a cooking show would be, and only slightly less entertaining. If I had only ever read Chapter 1, I think I would have loved this book. Everything that followed just kept going downhill at an accelerated rate. I think Scalzi really wanted to write something that would resonate with Trek Fans, play up the tropes, and have fun. I’m sure he did, but overall it felt awkward, clumsy, and an effort I was not expecting from one of the top sci-fi writers out there in the world today. Like I said, I gave it a shot because I like John’s blog and I like what he stands for. Sadly, this book was a miss for me. Sorry John. I’m hopeful his next book will be a better effort. I picked up this book because of two reasons. First I saw him on the Ellen show so I found out he had a book to begin with (don’t judge me for watching Ellen. She’s awesome). Second because he did so well this year on the World Series of Poker and I saw his face many times. He was funny and I knew he was an actor, I just couldn’t place him. At least not until I read the book and had a lot of “That was him in that movie?” moments. First off he’s a stand up comic and impressionist. That I was aware of because on the Word Series of Poker he did a lot of impressions. He’s a funny guy and made for entertaining television. I had to go back and watch some youtube clips and found a plethora of videos. Far more than I was expecting, but this guys been in the business for years so it shouldn’t have surprised me. Then he starts to talk about a Few Good Men. HOLY CARP! That was him! Standing next to Demi Moore and Tom Cruise during all those court room scenes. Now I recognized him and all those scenes came back as he told story after story of being on the set. Let me say right now, he tells a story and everything comes across as funny. Okay, almost everything. He’s never been a major star. He’s always been second banana. So if you’re thinking he’s the guy that went off and married a model or anything like that, well, no. What’s great is that he gives insight as to what’s it’s like to hang around some of these mega stars like Bruce Willis, Jack Nicolson, Tom Cruise, Steve Martin. His take on these people will give you more insight to these actors than any biography will as I’m sure they’ll exclude many things Kevin decided to keep in. I thought it was funny, given the number of movies he’s been in, that he’s still just an average guy doing something he loves to do. It’s obvious he’s having fun and yet he still isn’t a mega star that’s hunted down by the paparazzi. He can go to get a burger anywhere he wants or play in the World Series of Poker and people aren’t clamoring all over each other to get to him. There are a lot of moments in the book that hand me laughing out loud and the wife kept looking at my like I’d somehow lost my mind. If you like actors, movies, and a humorous behind the scenes look at what the big stars to and how the industry (on a minor level) works, then this book is loads of fun. If you’d like to read how one boy went from doing lip syncs to Bill Cosby records to being a minor movie star without ever being a star, check out his book. It’s filled with lots of good laughs. If you ask Dave Mustaine he will probably tell you that he single-handedly created the Thrash Metal genre we’re so fond of. He’s arrogant, rude, and considered by many to be a self-serving jerk. I think this is why we find him so endearing, don’t you? Why else would I feel compelled to buy his book and read about his exploits? It’s not like I hadn’t heard most of these stories over the years during interviews, VH1 Behind the Music, and other Metallica and Megadeth documentaries. If you’ve followed Megadeth and Metallica at all over the decades (wow, really? Decades? Man I feel old now) you’ll likely know most of these stories as well. From Dave getting kicked out of Metallica to Dave forming Megadeth to Dave doing drugs to Dave fighting to keep his band together to Dave’s sobriety. Yeah, this is a book all about Dave from his highest highs (and boy did he get high) to his lowest lows. Even through his drug induced haze he’s always kept his stories consistent so it’s impossible to say he’s lying about the events that took place. It’s not like you can just make stuff like this up. I would tell you to buy this book if you’re curious about the man behind Megadeth. I will admit that had it not been for Dave, Metallica wouldn’t have been the band they grew to be. I don’t think they would be the band they are or have gotten there in the manner they did. Dave was going in one of two directions, a rise to stardom or six feet under. As a fan of Megadeth, I’m glad it was the former. The book does retell many stories that Dave has told before, but their told in much greater detail. I don’t know if Dave has a mind like a steel trap and he could actually recall all the names and places in the book or if someone had to help research these for him. The amount of drugs he was taking and as high or as drunk as he was during certain events, I’m sure someone had to assist along the way, but it’s great to see just what the band went through to get to where they are today. There’s no doubt in my mind that Dave is smart and brilliant, but drugs and attitude got in his way so many times and he could have been something greater. Are you a fan of Megadeth? Are you a fan of Dave Mustaine? Unlike Ozzy’s book I Am Ozzy, Dave doesn’t have the stories that make you laugh so hard you think you’re going to pop an eye out, but the book is filled with a lot of stories that make you wonder how the man is still alive after all these years and still playing guitar at break-neck speed. So I just finished reading Frankenstein. My Favorite Daughter was reading it for school so I thought I might as well read along with her. This is a very difficult book to get through. To be perfectly honest it was nearly as torturous as the torment the monster put Victor Von Frankenstein through. Seriously. The first part of the book is letters from a ship’s captain that picks up Victor. Okay, I was on board with this. Then we get into Victor’s account of his life. Then he creates the monster. This last all of two pages where he goes from reanimating animals to a man and then the monster is gone. Wait… I want to know more about this! Wait…where did the monster go? Someone dies, Victor goes back home. A relative is put on trial for the death and another innocent dies. IT WAS THE MONSTER! Yes, finally some action in this story. Victor faces the monster and they talk. A lot. Ad naseum. The monster tells Victor everything and I mean everything he’d been doing since his creation. There are chapters and chapters dedicated to the monster watching this family. The see the monster and decided it’d be better to just leave. Really? We never see or hear anything about this family for the rest of the book. Was it really that important? Were any of the events in the lives of these people of any import to the book? WTH? What does Victor do after telling this monster off? He goes on vacation to get his mind off of things. Wait a cotton-picking minute. He goes on vacation? This self-professed killer is out there, living near his family, and he decides to go on vacation? Is this where Stephanie Myers got her inspiration and logic for Twilight? SURPRISE! Someone else ends up dead. Victor gets blamed, but is released. So what does he do knowing this monster is still out there killing people? OMFG! By this point I’m reading just to get to the end of this book. I’m waiting for Victor’s dearest Elizabeth to get whacked. I mean, seriously. Lizzy Frankenstein? She deserved her literary death. Only then does Dear Doctor Victor Von Frankenstein decide it’s high time to kill this monster. For some reason the monster leads Vic on a merry chase through the artic north and we finally come full circle and we’re back to letters from the captain. Yes, letters again explaining in great, lengthy detail as the dear friend of the captain slides further and further into madness and poor health, yet they continue to chase the monster for him even to the detriment of the crew. Finally good, old Vic dies and the crew starts home. The monster shows up and basically says “I’m sorry I made your life the hell you made of my life. Too bad you’re dead so you can’t hear me apologize. I’m going to go burn myself now that you’re dead.” And the monster disappears and we never really know his end. I understand that this book is a classic. I get that the language used in the book is from a distant past. The concept of the book is creating life from death. I think that’s awesome. What I don’t get are all the side trails this book takes that are totally unnecessary and do nothing but make the reader sit back and wonder why. At least that’s what happened to me. I know it was supposed to be the modern Prometheus. A creator overstepping his bounds and doing something only to serve his own ego. But Prometheus was punished by a higher authority than himself whereas Victor was punished by his own creation due to complete and total stupidity of the creator. All I could think was. AAAAA! MONSTER. Oh, good It’s gone. Now it’s someone else’s problem. Wait, it’s killing my family. I’ll deal with it later. Wait! It’s still killing my family. Oh well, I’ll go on vacation. Do yourself a favor: Don’t read this book! I read it because I’ve seen all the movies related to this book. They spend time with the creation and the monster and the why and not with all the drudgery of all the mundane crap this book was loaded with. If you read and enjoyed this book, good on you. I read it only to say I did. I will never revisit this book. It is not where it belongs, in my behind…er, my past. As a reader: I love a book with a strong protagonist. Someone who needs to overcome overwhelming odds in order to succeed. I also love YA books because they have a more simplified plot and not as many twists and turns so the story progresses faster. The Hunger Games is very much a YA novel in that respect, but much like other beloved YA books there is a large cast of characters. Most of them we never get to know very well and that’s because the hunger games is a place where a lot of people die. Our main character, Katniss, starts out in her poor sector of town and takes her sister’s place in the games. Unfortunately she knows the other boy selected, but not well enough that she really cares about him. They have a couple encounters before the selection process so we know there is something between them. The outer rings are the poorest (Katniss is from the poorest) and as you get closer to the capital the rings are richer and have better ‘tributes’ to send to the games. It was interesting to follow her through the process of going from a girl hunting illegally in the woods to provide for her family to a girl in the games. Each ring sends two into the games so there are a total of 24 kids. At first I had trouble with kids fighting to the death, but hey, it’s a YA book. That’s what they’re for, right? To be main characters. It wouldn’t have been as effective if it had been adults. One things that I did notice when they were sent into the arena was no one just gave up. I would have expected at least one or two to just succumb to fear and give up before they ever ran into the field. Katniss doesn’t kill anyone until deep into the book, but rather waits for others to kill each other off before she strikes. Her first kill is one of vengeance so it’s not like she was a cold blooded killer and her final kill is one more of mercy for the wounded person. The twists, at least for me, were expected where her partner was ‘in love with her’ even though she thought of it as just a ploy to gain more sponsors and allowing them both to live cheapened the ending for me. Perhaps it would have been too tragic of an ending, but I didn’t care for it. I’m sure the ramifications will carry over into the second book so I can’t fully write this one off as a cheap ploy. I also didn’t care for all the ‘dead’ kids coming back as zombie werewolfs either. I’m not sure what the point of it was. It could have been any mutant wolves and this really didn’t add anything to the story for me. Having read a lot I saw the ending coming from far off, but that didn’t stop me from reading. It’s well written and, even though sad at parts, a great read. As a Writer: Like I just said, I saw the ending coming from the time the two of them were selected. The foreshadowing was very up front and it was quite easy to see where this was going to go. Her rebellion, her survival, her saving of her partner, even the Romeo and Juliette style near death was all easy to see coming from a long way off. Despite all of that it’s a great book that’s written quite well. We only ever follow Katniss along so it’s very focused in its narrative style. Because the narrative is very tight, there are only minor flaws and plot devices used to push the story forward. If you have been writing for any length of time there are no real twist and turns that will have to trying to figure out what is going on. It’s a very straight forward story. What I really liked about the story is there is no real sense of good versus evil. Just the need to survive. Or more the need not to get killed. I like this concept in that everything around it just so unfair that the only way to overcome is to do what’s expected even if it means you’re only serving the machine. Of course you expect the main character to throw in her own little rebellion and this serves to push the story toward a second book. Recommendation: If you like YA, read this book. It’s good writing. It’s also a fairly short book and a quick read. Not to be confused with the comic book crows Heckle and Jeckle, this is the book by Robert Louis Stevenson. Written in 1886 this book suffers from a couple things. First it’s a very explainy book. Second it’s extremely short. Just slightly longer than a novella today. 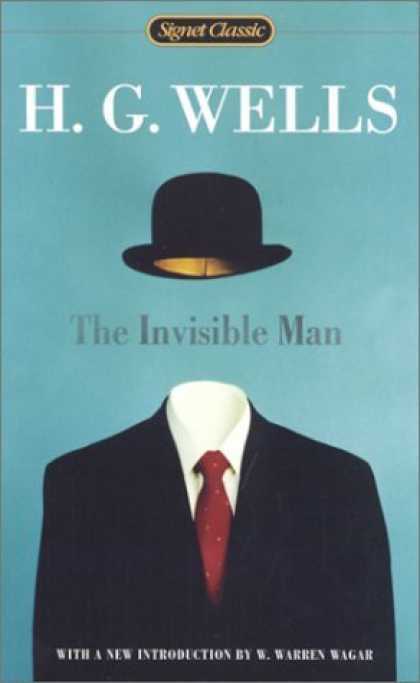 That being said, this is the traditional book about a man who changes who he is and becomes a totally different, and in many aspects, unsavory character. As a reader: I’ve read a lot of book across a number of decades. More decades of book than decades for me. I can see where this book would appeal to the time as it’s a short book with an interesting concept that the more you think about the story the more you can add to it in your own mind. Having seen movies and other characterizations about Jekyll and Hyde I went in with a lot of preconceived notions about the story. It was always my understanding that Jekyll was looking for a means to transform himself for some reason and goofed up and tapped into his inner demons and let them free on accident. Oh heck no! He knew exactly what he was doing at the onset and enjoyed being Hyde. At least at the start of the book. His biggest mistake was not creating enough potion to transform himself back to Dr. Jekyll and getting ‘stuck’ as Hyde. This was his way to escape his life and live the life of someone younger, stronger, but shorter and uglier. People are repulsed by Hyde and can’t rightly explain why. He’s easily identifiable because of his hideous demeanor. Dr. Jekyll is alive and aware inside of Hyde the entire time. He knows what’s happening and enjoys the freedom to not have to perform the regular duties of high society that his doctor status force him into. As Hyde he is able to be free to do what he likes with little regard of what others think of him. Even though I had difficulty with the story as it was told, I still enjoyed the concept and the way it played out in the end. As a writer: This story lacked in many way. It’s almost told as a series of letters as if someone wrote their account of events. Only toward the end, after Hyde is killed, do we get to hear of Jekyll’s position and what actually happened. I didn’t like how the main character wasn’t the person doing the telling of the story. Instead we get a second hand account and reactions of other people as to what’s happening with with Dr. Jekyll and a letter telling us what happened rather than insight as to what Dr Jekyll is going through. This, for me, made it a difficult story to read because I kept not caring about what was happening. I never felt sympathetic for anyone in the story. Yes, things happened and they took place over a long period of time, but I never got a sense for just how long certain events took to play out. I’m guessing that everything happened over the course of a year, but I’m not sure. Recommendation: This is a classic and a very short read. Read it. It is a classic novel. Don’t expect it to live up to the movie version of the characters. What you will find is a great idea for a story that’s explained to you and executed less than the hype it’s gotten for over a century. Growing up as a kid in the backwoods of Minnesota I spent a great deal of time dreaming of what I would do if I had super powers. I had read a lot of comics and knew a lot of different super heroes. I spent a lot of time staring down a tree trying to bend it to my will. I never succeeded. I jumped off a lot of things in an effort to fly. I’m lucky that I never broke anything. I held my breath for what felt like hours and it turned out to only be seconds. I found tools and old objects in the ‘dump’ we had in our back yard. The ‘dump’ was a large hole in the ground that we were trying to fill in so people would ‘dump’ all sorts of things back there. A lot of broken lumber, old cars, appliances, trees. It was great fun to explore as the pile changed all the time. My brother and I had built a tree house from scraps, put knobs and dials on the walls. Constructed our own contraptions that did many different things. What I’m saying here is Mike has written a book that really hit home for me. As a Reader: Mik, for me, is a typical boy. One who is not content with just being a boy. He wants to do more and be more than he is. He tries hard and when bullies knock him down he gets right back up. When he runs into a problem he can’t solve, he tries to gain super powers to over come them. That’s just like any eight-year-old I know. Through trial and error Mik succeeds in failing in many interesting ways. Along the way he’s bullied by a girl and her dog, a glowing turkey, and continues to work hard along the way. This book is intended for middle-school to young adult and it’s a fun story. It’s told in a series of events throughout the school year and each has Mik working hard to resolve the problem or situation at hand. Not the least of which is keeping his superhero secret identity from his parents. Mike Plested does a great job with building Mik up, giving him challenges that he must think his way through, and work hard to overcome. Not everything he does is successful and Mik learns through trial and error. As a Writer: When I got through the first half of this book, I had thought the story telling was a little bumpy in spots and I had gotten into the meat of the story. What I discovered was this wasn’t just one story, but multiple stories all wrapped into one. I loved the way Mik went through all his attempts trying to discover how to achieve his own super powers and always had to come to a solution that made sense and fit within the reality of the story. Mik’s growth from frustrated kid trying to gain super powers to a boy moderately satisfied with accomplishing tasks within his own means is a fun growth arc. For the most part Mik is left to his own devices though there are times when his parents intervene on his behalf and that helps to add to the realism of his growth. The adults are not clueless, but don’t pry too much which gives Mik freedom to do what needs to be done to work on achieving his dream. Recommendation: Mik Murdoch is intended for a younger audience. Knowing that going in will allow older readers to enjoy this story. Even if this isn’t your cup of tea, it’ll make great reading for your middle schooler or young adult reader. A fun journey of a young boy and his dog (Krypto). From what I can tell we’re not done with Mik. Or at least we can hope we’ll see more. This is only the start of great things to come from Mr. Plested. I’m glad to say I was there from the start. I’ve read some stinkers in my years. With the glut of ebooks out there and so many people forcing free ebooks and eshorts into my hands these days, it’s easy for one to get lost in the shuffle. As a Reader: I was in the mood to read a novella. I had seen this one out there for free and grabbed it up about a month or so ago. I was in the mood for some short steampunk and decided to give this one a shot. I had just gotten done with two other free ebooks and when I say done I mean I wasn’t even halfway through when I decided they weren’t worth the effort. Then I started Flash Gold. Right of bat I was sucked in. Our hero was in trouble and needed to find a way out of it. People were out to get her. Yes, her. Been a while since I’d read a female protagonist done well so I kept going. My intention was to just read a little bit and go to sleep. I’m glad this was a read because I didn’t get back to sleep. Unlike some stories I’ve read where the steampunk is window dressing, Flash Gold keeps it right there in the forefront. The technology of the Yukon is just as much a character as anyone in the story. From automotons to airships to steam powered dog sleds (minus the dogs). Even the mystery of what exactly is Flash Gold. I got done with this one and immediately went out and bought the sequel. I know it’ll be as much fun as the first and I’m curious to see where Lindsay is going with this one. Check her out over at (http://www.lindsayburoker.com/). As a writer: I hate it when I’m reading a book and I see the ending coming after page 1. That did NOT happen with this book. I really enjoyed not only Lindsay’s writing style, but her pacing and build up as well. We’re thrust into her world and kept there following our main protagonist all the way. I liked the strong female protagonist. 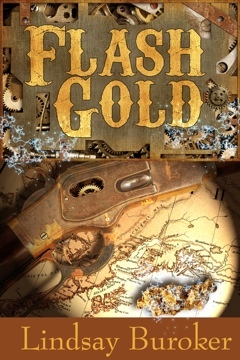 Her father is gone and she’s left to her own devices protecting the secret of Flash Gold. This made for great confrontations with villains and a race that she needed to win. My only complaint is there is so much story to tell here that I was sad once I got to the end. But it was a free ebook and I’ve already got the sequel lined up in my queue to read. Recommendation: This is a free ebook and not just any free ebook. This one will be a gateway that will lead you into more of Lindsays work with no financial investment. It’s a fun, light read that you will get through quickly because so much happens in such a short period of time. Do yourself a favor and grab this one. You won’t be sad that you did. I listened to this book on audio. I’ve got a lot of things to say about this book so get ready. There may be spoilers. You have been warned. As a Reader: Stephen King hit the mark with this one. I was disappointed with the ending of his last couple of books so as this one neared the end of what I thought was the end of the story. I was quite wrong where the story was going to end. It kept going, and going, and going sort of like the Lord of the Rings. I loved that it didn’t just drop me and leave me wondering or have some weird/corny ending that left me miffed that I’d wasted my time. King takes us from 2011 back to 1958 several times. Each time things are reset. When George Amberson (the character’s assumed name in the past) stays longer to prevent the assassination of JFK things get weird. There’s a long time for our main character to wait. I had a little struggle with how easily he accepted this task from a person eh didn’t know very well. This part seemed to be glossed over in favor of the person going back to a past he had never lived in. It bothered me, but only slightly. There’s a lot of fun King had in the past. It almost felt like he was reminiscing about his boyhood. Perhaps longing for a simpler time. I’m not really sure. There are a lot of side trails along the way to stop the assassination and I really didn’t mind them. This is what King does best is to draw you into the characters life. It’s like the end of the Dark Tower. It’s not about the Dark Tower, it’s about the journey. He layers detail upon detail in a way that builds a tapestry you can believe in and learn to love. Then he yanks the rug out from under you, stand you back up, dusts you off, and does it again. Each time you curse what the characters are doing to each other and the lives they’re ruining even though this is only a book. The end had me tear up a little I’m not ashamed to say. King has a way to get you to really care for the characters. He’s always done that, I’m sure he always will. But the ending of this book (as he mentioned in the afterward) was inspired by his son, Joe Hill, who recommended a different ending. It was a drawn out ending, but satisfying. A very enjoyable ending indeed. As a writer: Mr. King, please stop feeling like you need to intermingle your works. Yes, you had nods to IT, Christine, and other works I’m sure I missed. Let a work stand on its own. This bothered me to no end as it only provided lines of thinking that lead no where and annoyed me to no end. As did the pie throwing scene. I read Mark Evanier’s blog and he went on and on about this. 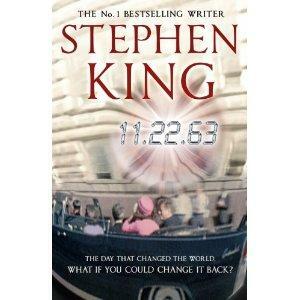 I wish Stephen King would have as it does relate to the era. One pie = funny, many pies does not equal funnier. Also, they’re not real pies. I refer you to http://www.newsfromme.com/2011/12/13/recipe-corner/ . I really enjoy how Mr. King doesn’t just have someone go and buy a jacket or a hat, or a gun, but will take a small bit of time to explain what it is, why the character is buying it, introduce you to the person doing the selling, and spend a little time doing some things that might otherwise be considered mundane. He makes them interesting and fleshes out a story in a way that makes the world feel real. He doesn’t skimp. He doesn’t take shortcuts. He loves to drag you along before he slaps you with the reality he’s built in a real and brutal way. Recommendations: Other than that, I’ve got nothing to complain about. Not that I was looking for things to complain about, mind you. This book was wonderful. If you read it, or listen to it as I did, you will enjoy it. Stephen King is a master at what he does. He doesn’t write horror or sci fi. Those are only trappings attached to his name. He writes stories about people. People you will like, some you will hate, some you will come to think of as real people. I’ve always liked that about his work and 11.22.63 did not disappoint. Well worthy of your time. Do pick up this book. I can’t wait to see what Mr. King has in store for us next. As a Writer: There are a lot of explanations in this story and even more ‘head hopping’. Even when in one person’s head there’s a sudden shift to someone else’s point of view then back into the other’s head .This causes a little confusion but the explanations really slow down the pacing of the story. Listening to this on audio (kudos to Mr. Foster on his reading) helped me get through the difficult parts. The sudden shift toward the end of the book seemed like a desperate grasp to make the story more compelling and it was at this point where the best writing in the book happens. It almost felt like someone else had written this entire section because the action is great, the descriptions flow well and there’s a limited focus on one character at a time. Recommendation: Read this book or listen to it. There’s a lot in here that’s great information and the way he describes his experiments is fascinating. Even though it’s explanation via a character, it’s still neat to go through the process and the accusation once he completes the process. This is a classic book and a short read. Definitely worth the time.